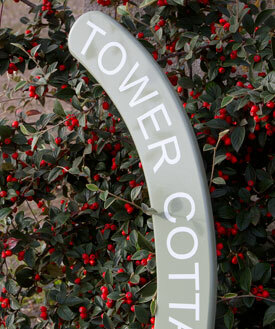 A simple but effective house sign which can be buried into the grass verge at your property entrance. 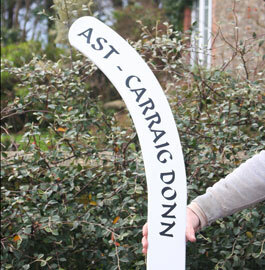 These are normally made from very long lasting tricoya board which is 18mm thick and cut into the shape of a hockey stick. Tricoya is a wood based board made using a high performance resin. It is very stable, strong, durable and weatherproof. The tricoya itself comes with a 50 year guarantee. (25 years underground) It is also environmentally friendly. 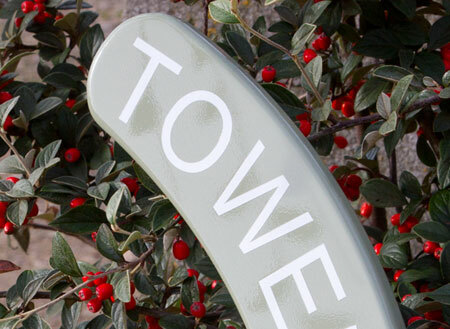 The standard colours are black, white, pale grey F&B Purbeck Stone and a pale green F&B Lichen. There is also cream, heritage green and Farrow & Ball Estate No.84 green blue, Stiffkey Blue, French Grey among others available at £5 per order Gold and silver is an extra £10 per order. . See our Stock Colours. You choose the background color and the letter colour. For colours we don't stock the cost is £65 per colour per order. We can match Farrow & Ball, Dulux and RAL colours. 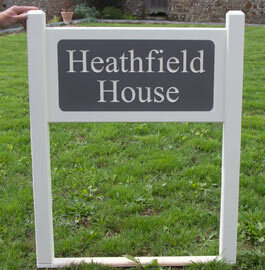 We have two standard sizes but as always we can make these entrance signs just the way you want them. We do suggest though to use just capital letters. We suggest that 450mm - 600mm is buried in the grass edge. We do lots of other painted signs if these are not appropriate. If you would prefer to have a high gloss finish we can coat with Coach-Kote. This is a clear version of the coach enamel used used on the queens carriages at Buckingham Palace. The addition of an extra coat of Coach-Kote will also add even more durability to the sign. Made in the UK. Our team at The Sign Maker looks forward to helping you with your hockey stick sign.